We are in the Lady Chapel (Mariakapel) in Hoorn, The Netherlands. What happened there in 1968 has happened with thousands of church buildings in Western Europe: it became vacant. Totally vacant? One day in 2012 a cloud could be seen in this chapel (see here), for less than half a minute. And that cloud gave light – the kind of thing that unfortunately did not happen when the pews were still present. Berndnaut Smilde is a young Dutch artist. He delivers experiences. Earlier on, for instance, he sprayed a space full of hospital air, which brought back memories in the visitors of the times they were in hospital themselves. He also projected a rainbow on the photo of a landscape. Just for a moment you think it is real. Smilde’s work reminds us of The Weather Project by Olafur Eliasson, that I wrote about before on ArtWay. Millions of people drank in his imitation sun. Millions of people also saw Smilde’s photo. For some time he had been creating clouds in diverse spaces, but this rendering caught on and whizzed rapidly all over the Internet. Also the Saatchi Gallery in London, England acquired it for its famous collection. I suspect because his image is totally at home in a place of worship. In other locations his clouds sometimes come close to a magic trick. But here, in the mysticism of such an empty church space, the surreal character of this indoor cloud seems to fit. Smilde titled his photo Nimbus. That is short for what we usually call a thundercloud. But it is also a halo or aureole around the head of a saint. How ambiguous! It is the same ambiguity that we also encounter in the ‘mysterium tremendum et fascinans’. Divine mystery fascinates, but also makes us tremble. We can call this ‘the fear of the Lord’. Whoever experiences God, feels an astonishment that comes close to fear. With his title and choice of location Smilde himself hints at such a religious reading of this work. When it comes to clouds, believers have indeed often thought of God. When long ago the Jews fled Egypt, a cloud went before them during the day, in which God was present. When Solomon consecrated the temple, a cloud came down into the temple, designating that God had finally entered into the building. Later Ezekiel saw a cloud leave the temple and his conclusion was: God has left us. That is what I see in this photo. This church may have been empty for almost half a century, but God is still there in a hovering, fleeting manner. This work by Smilde stands in a long tradition of transience. We all know sand and ice sculptures. Or think of street artists with their chalk drawings that are washed away by only one rain shower, or of the potato heads by Giorgina Choueiri that will quickly sprout and disfigure the faces. It is fascinating that the ancient Hebrew nation experienced God’s presence as a cloud. A cloud can disappear just like that and changes its form constantly. But a cloud stands, at least in dry countries, also for hope. A fluffy spot on the horizon means rain. Out of that mysterious, elusive form flows tangible water that moistens the soil so that green shoots up. Somewhere in that cloud must live a source of life. Apparently the Jews experienced God as both life bringing and elusive. God, the eternal one by definition, expresses himself in the transitory: a word, a name, a Jesus, a cloud. 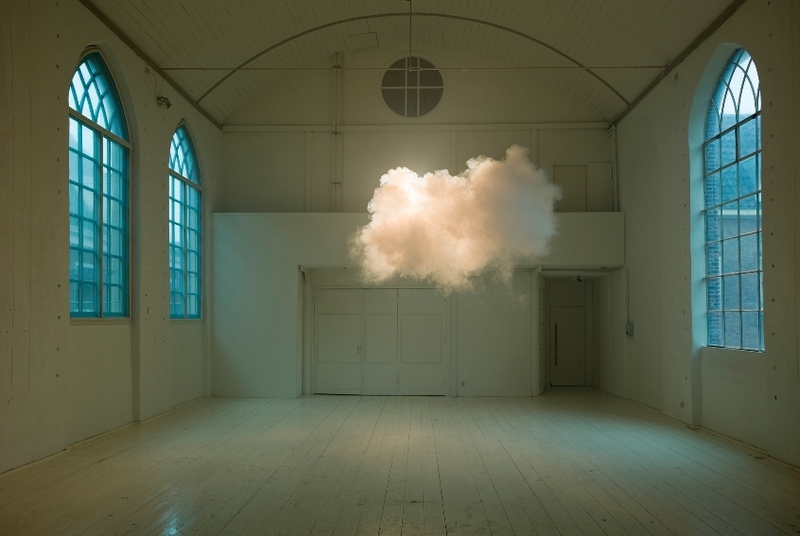 Berndnaut Smilde: Nimbus II, 2012, Lambda print, 125 x 186 cm, Saatchi Gallery, London, England. Reinier Sonneveld (b. 1978) is a writer. He makes his living by creating short films and writing (mainly theological) books. He was the youngest writer in the Netherlands to receive the Prize for the Best Christian Book. He is also a member of the board of Artway.